We know not everyone interested in the Albany Power eXchange actually lives in Albany. For our members who travel long distances from the North, we offer the APeX North Country Munch as a monthly social gathering in Saratoga. 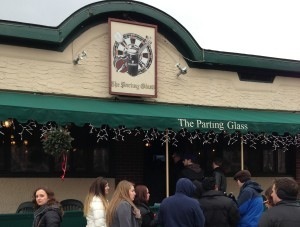 The North Country Munch takes place in the private “darts room” of the Parting Glass pub. It’s a great first-timer event as it’s in an open restaurant which is always busy. It’s a great non-threatening environment to come talk to people and learn about APeX and its members. The NCM is held the second Tuesday of every month from 7:00 – 9:00 PM at The Parting Glass [Google Maps Link] Cost is whatever food you decide to order. You are not required to order a full dinner, but keep in mind that this is a restaurant which makes its money selling food and welcomes us back each month based on the business we bring in. Ordering at least an appetizer or a dessert helps both the restaurant and us. We generally take up the back corner of the restaurant. You may see us straight ahead from the door as you enter the restaurant. Just walk over, and introduce yourself to our hostess who will introduce you to others and make you feel welcome. No RSVP is required for munches, so feel free to just drop by. Any cancellations or changes are always posted to our mailing list.